A.O. Wheeler’s two volume set on the Selkirk Mountains of British Columbia, 1905. Vol. I is extensively illustrated in black and white. Vol. II is a map portfolio. If you use Windows, you may need Acrobat Reader to view the PDFs. It is a free download. An award is given to the best magazine article of the year. 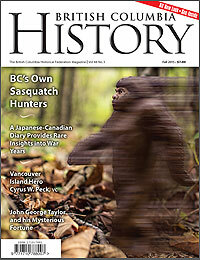 The cover of a recent issue of British Columbia History. Member Societies are encouraged to recruit subscribers to British Columbia History. Publications of the British Columbia Historical Federation, 1923 - 2007.
pdf files for the Cover and Table of Contents only. Issues of the magazine published since 2008 are not accessible online but are available for purchase. Vol. 48.3 | Fall 2015 is SOLD OUT. pdf files for Volume numbers. Each year, the spring issue of the magazine features a theme. British Columbia History publishes feature-length articles as well as documentary selections, essays, pictorial essays, memoirs, and reviews relating to the social, economic, political, intellectual, and cultural history of British Columbia. Articles can vary widely in word length, from 1000 to 5000. It is published four times a year, in March, June, September and December, with strict, set copy deadlines, by the British Columbia Historical Federation. Editing is conducted in consultation with the authors and the Editor reserves the right of final sign-off. Authors should familiarize themselves with the BCHF Publication Agreement prior to submission.